Over Memorial Day Weekend, I took a trip to one of my favorite places in Washington: Lake Chelan. This has been a favorite of mine for a number of years. 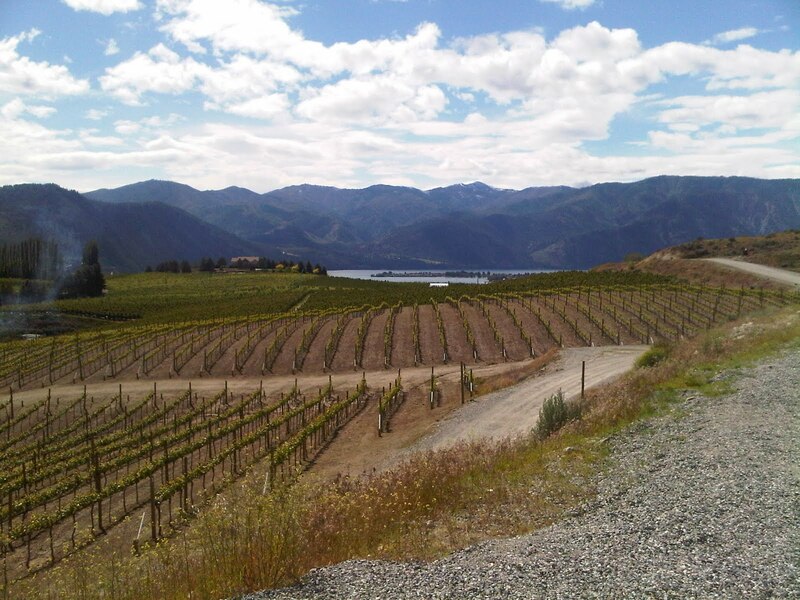 Beautiful views, nice weather, and wine; lots and lots of wine! 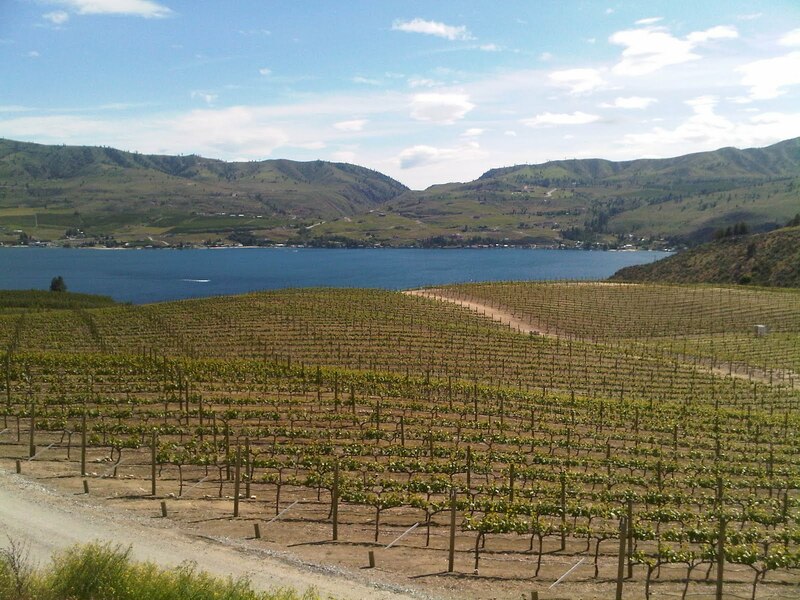 I had previously visited a few of the Lake Chelan AVA (@LakeChelanAVA) wineries over my birthday weekend in 2009 and was eager to get out and hit a few more on this go around. I stayed with family in Manson and split up my wine adventures over two days of the holiday weekend. I must have been on a Viognier kick that weekend (nice weather maybe? ), because as you'll see, I picked up a few bottles of that along the way! 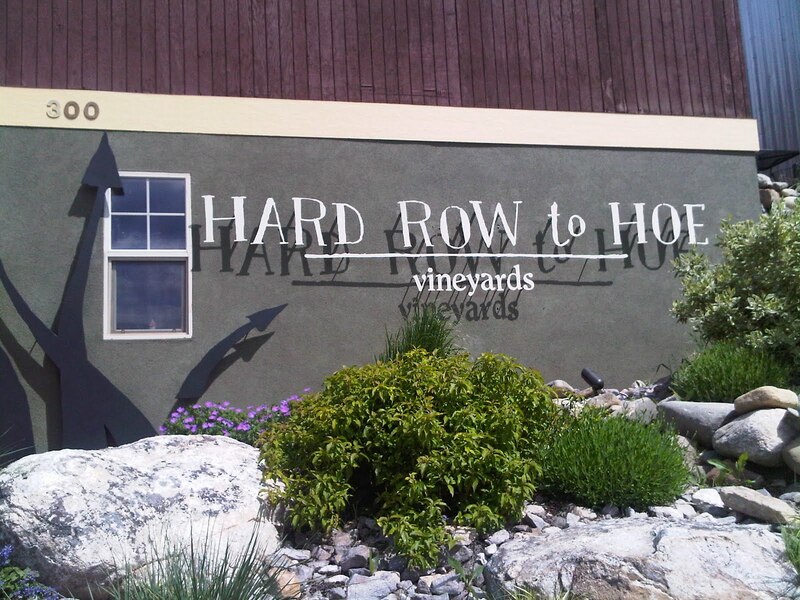 On Saturday we set out from Manson and headed up the hill to Hard Row to Hoe Vineyards (@hardrow), a winery that I was very eager to check out after meeting the owners, Don & Judy Phelps, at previous events in Seattle. I had also heard rumblings of an interesting wallpaper that was a "must see" in the bathroom at the tasting room (those of you who have been there know what I'm talking about). We drove up the hill toward the winery and saw Don hard at work on the tractor out in the vineyard. 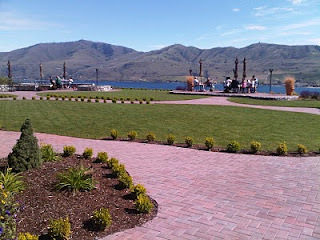 We arrived to the sun soaked patio at the winery and were able to taste at their outside tasting counter, which had been set up in the front of their warehouse. We started with the whites and rosés, and the 2009 Pinot Gris and the 2009 Shameless Hussy Sangiovese Dry Rosé were easily my favorites of the bunch (That Shameless Hussy wine went on to be great prizes for a tasting event I had with some friends the next week!). Of the reds, I really enjoyed the 2007 Iron Bed Red from the Wahluke Slope. Hard Row has a great set up where you can sit at a table and enjoy a bottle, or stroll around and check out the row boat (also available for photo ops!) and the views from the hill of the lake. 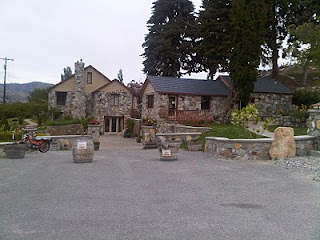 Next, we stayed in the Manson area and headed over to Four Lakes Winery (@FourLakesWinery), which has a fantastic location for their tasting room. 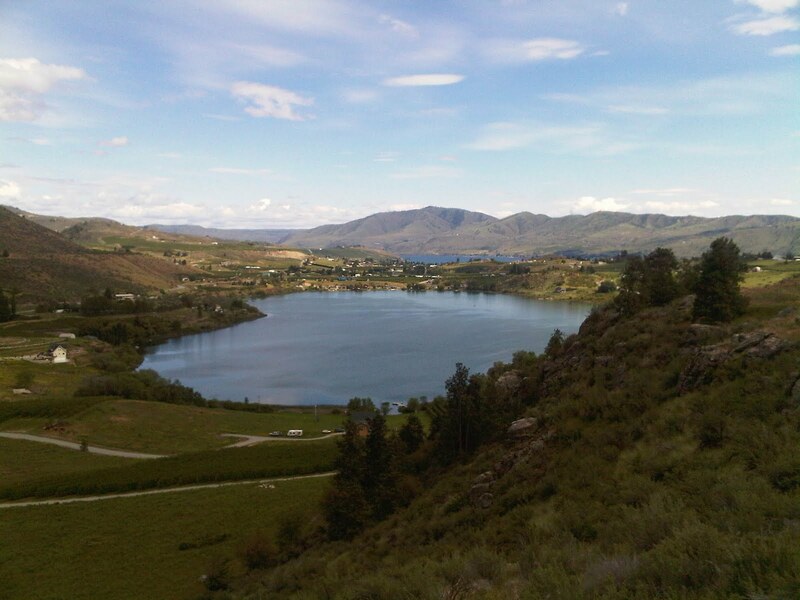 The site sits on the top of a hill and you can quite literally see all four of the lakes in the area: Wapato Lake, Roses Lake, Dry Lake and Lake Chelan. Talk about a view. The day we visited, they happened to be having a party with live music, food off the BBQ and great wines! I headed to the outside counter first to try their nice chilled whites, and found a favorite in the 2007 Sauvignon Blanc from the Columbia Valley. What a great summer wine for a beautiful sunny day like this one! 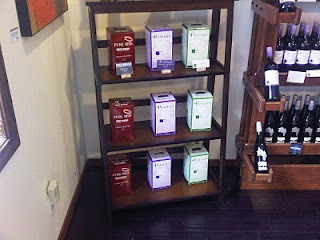 I battled the crowds back into the tasting room to the counter and tasted through their reds also. The 2008 Estate Grown Syrah from the Columbia Valley was a quick favorite of most I was with (including myself!) and I ended up leaving there with a bottle of that. I was impressed with their wines, as this was a winery I had never tried before (or even heard much about before my visit!). They have an amazing deck and it's a great place to kick back and take in the views. Our next stop was down Highway 150 a bit, and we headed up to Benson Vineyards Estate Winery (@bensonvineyards). What a beautiful winery, patio and view. I quickly put this on my top 10 dream wedding locations list. The Mediterranean-inspired architecture here is just stunning and the surroundings make you feel like you're straight out of Europe. 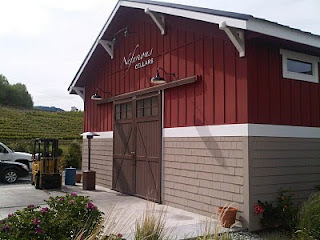 I tasted through several of their wines, including the 2008 Chelan County Viognier, which was a big favorite. 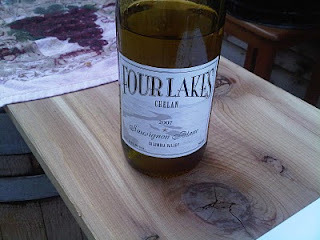 After the rest of the tasting, I ended up getting a glass of the Viognier to relax on the patio with, in addition to the bottle I bought to take home! I can't wait to drink this wine on a patio in Seattle somewhere too! On Sunday, we started off at a winery where I am in one of my favorite wine clubs, the Sparkle Club at Karma Vineyards! 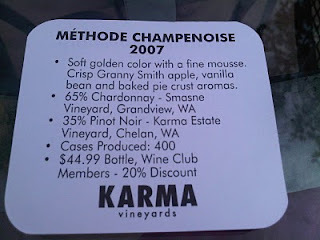 I visited Karma in 2009 and fell instantly in love with their Methode Champenoise, which they make the old fashioned way in their cave (yes, they have a cave!). I was sold when they told me I could get two bottles of this twice a year. It has become my "special occasion" sparkling wine and used for past events like weddings, New Years and Valentine's Day! When we arrived at the winery, we grabbed a table in their outside bistro area. The tasting flights come in the cutest holders, and I need to find one of these for carrying three glasses at once at home. We tasted the 2006 Chardonnay, the 2006 Estate Pinot Noir, and the 2007 Zen, a 60% Syrah, 27% Grenache and 13% Mourvedre blend. 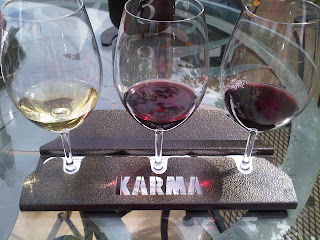 Another red of Karma's that I really really enjoy is the 2007 Try, which is 60% Cabernet Sauvignon, 30% Malbec and 10% Merlot. I picked up a bottle of the Try last year and it was most certainly on my list again this year as well. 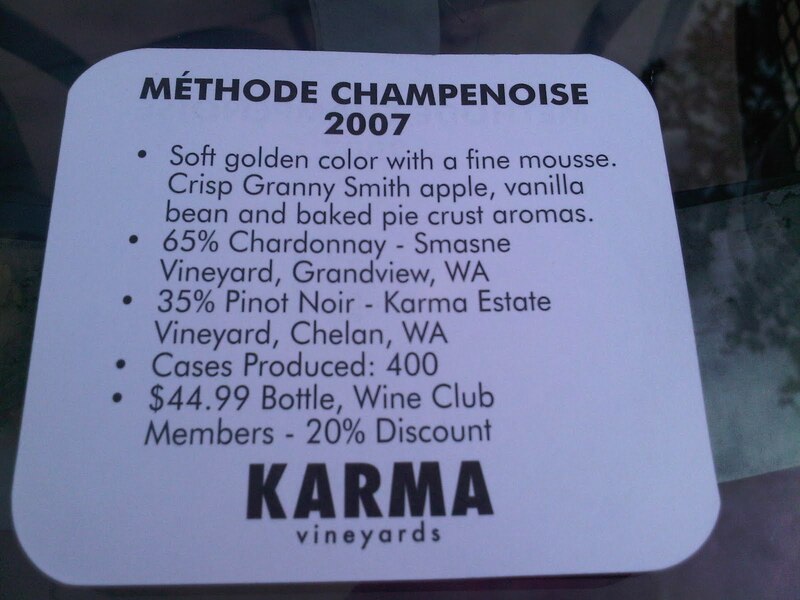 After our tasting flights, we ordered a glass of the new 2007 release of Methode Champenoise, which is a 65% Smasne Vineyard Chardonnay. 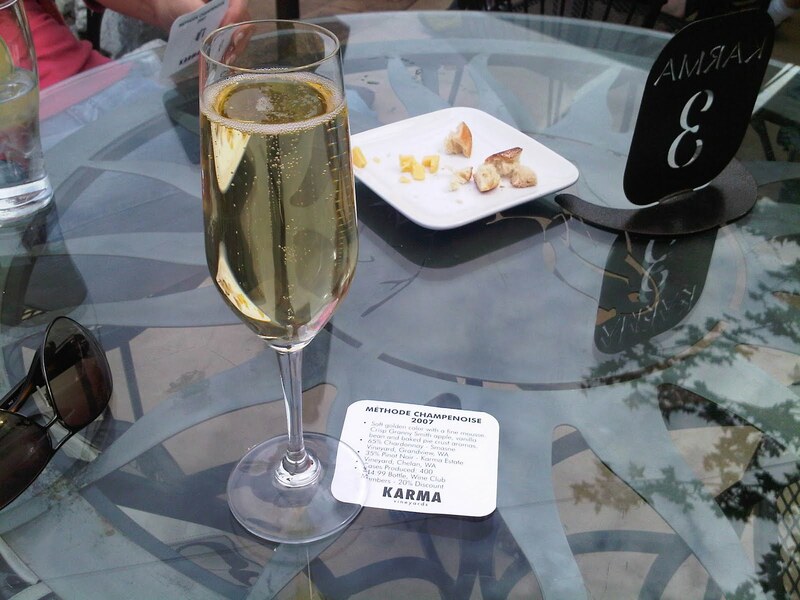 There is nothing better than sipping on some bubbles next to a creek on a nice day. Karma has a great location with great atmosphere! After leaving Karma, we headed just down the road a bit to Nefarious Cellars (@NefariousWines), which is a winery that I had been hearing rave reviews from people about and was super excited to finally check out for myself! I was not disappointed in the slightest, what a fun place and fun people! We pulled into the parking lot outside the winery and were immediately greeted by the welcoming committee, Lucy. 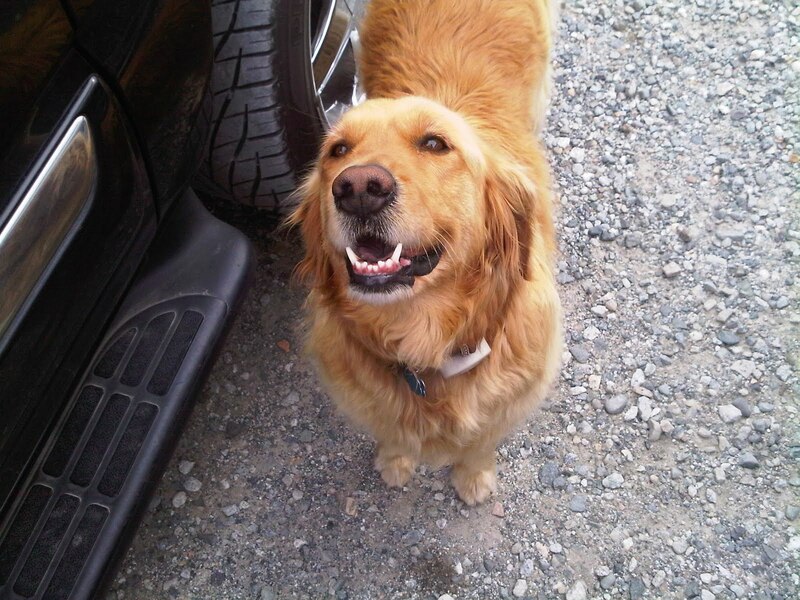 This golden retriever truly lives up to her name of "Head of Hospitality". She was at the side of the car before we could get the doors open and we watched as she ran off to greet the next car that pulled in shortly after us! 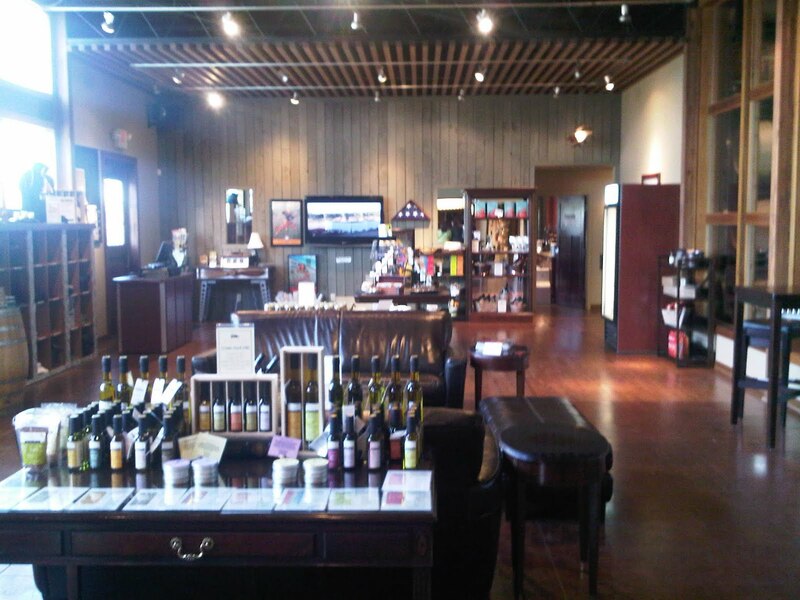 We headed into the winery (after a few minutes, that dog was just too cute) and posted up to the tasting bar. I was so thrilled to meet Dean & Heather Neff, owners of Nefarious. It was another instance of putting a face to a name that I had previously corresponded with on twitter! I found another Viognier I liked here, and left with a bottle of the 2009 Defiance Vineyard Viognier. 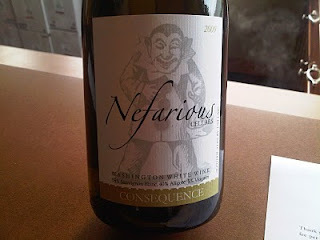 The new release of the 2009 Consequence was also quite wonderful. This is a blend of 55% Sauvignon Blanc, 40% Aligote and 5% Viognier. I majorly lucked out on my red purchase at Nefarious. They had just a case left of their 2007 Cabernet Sauvignon Riverbend Vineyard Wahluke Slope on the day of my visit, and I managed to grab one of the last three bottles! So excited for this one, it's a beautiful Cab that will pair with just about anything. 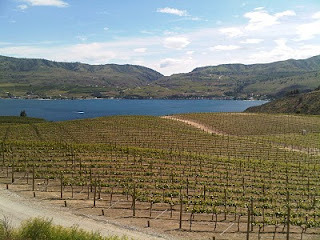 What a great experience here, I can't wait for my next trip back to Chelan to go visit with Heather and Dean again (and Lucy too!). 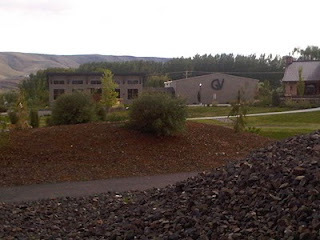 Our last stop was at Tunnel Hill Winery, another winery with great architecture for their building. 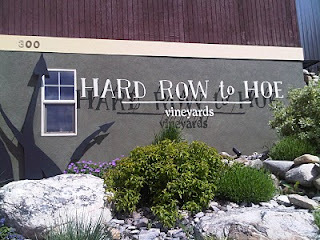 We got in just at the end of the day and were able to taste quickly through their two Rieslings, Pinot Noir and Syrah. My favorite here was definitely the 2007 Estate Syrah. Great flavors and well balanced. 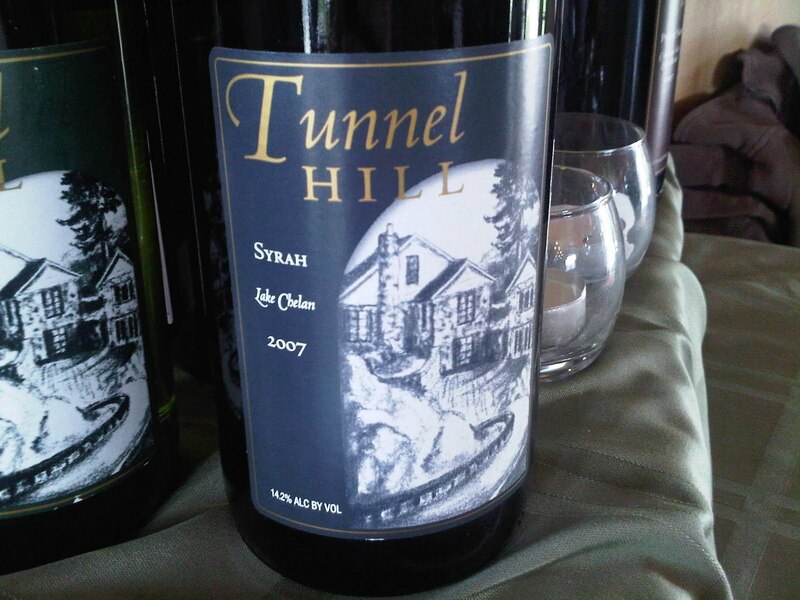 If we had more time at Tunnel Hill, it would had been nice to sit our on their patio with a glass, but unfortunately for us we came up short on time! There's always next time! Back in late May, a few of us headed east toward the Tri-Cities for a bridal shower for my wonderful friend Heather that was put on by some family friends. The shower itself was held at a winery (score!) 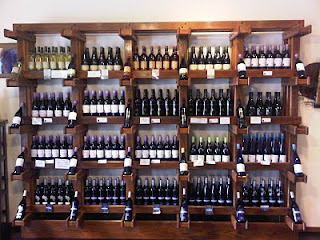 and we were able to spend other time during the weekend trying out several wineries in the area. There are some amazing wineries on the east side of the mountains, I wish we had more time to visit more during this trip, but we were pretty limited. 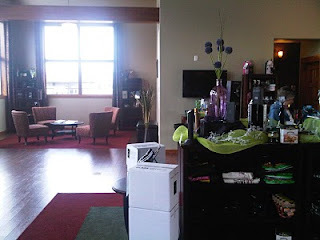 The bridal shower was held at Goose Ridge Winery, located in Richland, WA. Goose Ridge also recently opened a tasting room in Woodinville, adjacent to the Hollywood Schoolhouse, in May 2010. We had hoped for a beautiful sunny day so that we could have the shower on the back patio there (which is beautiful! ), but we ended up with a windy day that couldn't quite decide if it wanted to be nice or nasty out. Lucky for us, the interior of the tasting room has a great sitting area that was perfect for the shower. 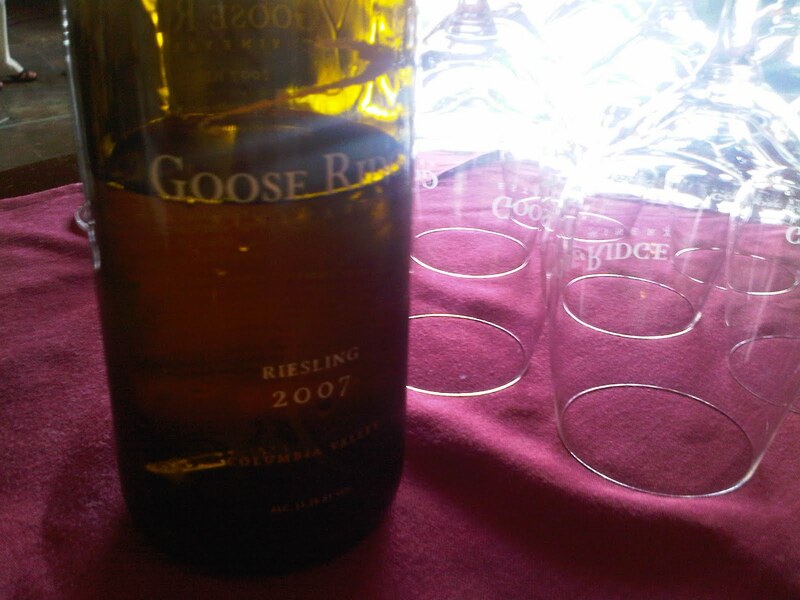 All the guests were able to sip on Goose Ridge's 2007 Riesling at the event, which was a great wine. I don't normally find myself too fond of super sweet varietals, but this one was fantastic! 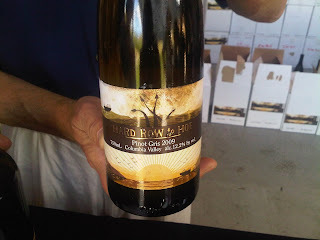 Loved the pear and apple flavors in this wine. The Riesling was also on sale that weekend for a great case price. Some friends definitely took advantage of that deal! After the shower ended, a few of us stuck around and tasted through their line-up in the tasting room. 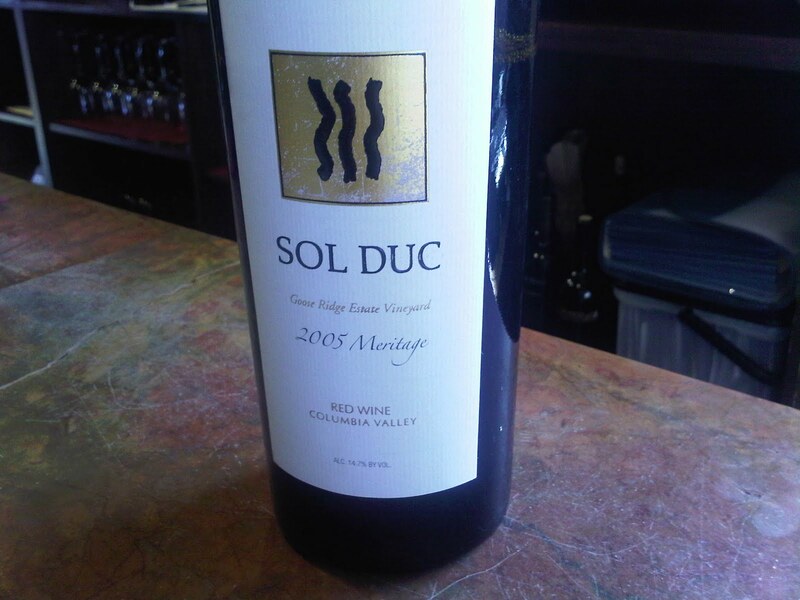 My favorite by far was the 2005 Sol Duc Meritage from the Columbia Valley. Talk about a great wine! This was a very tasty blend of 76% Cabernet Sauvignon, 19% Merlot, and 5% Malbec. Meritage has always been a big favorite of mine at a variety of different wineries. This one was a great structured wine with a nice finish. On Sunday of our wine weekend, we set out to make one stop in Kennewick at Badger Mountain Vineyard/Powers Winery. 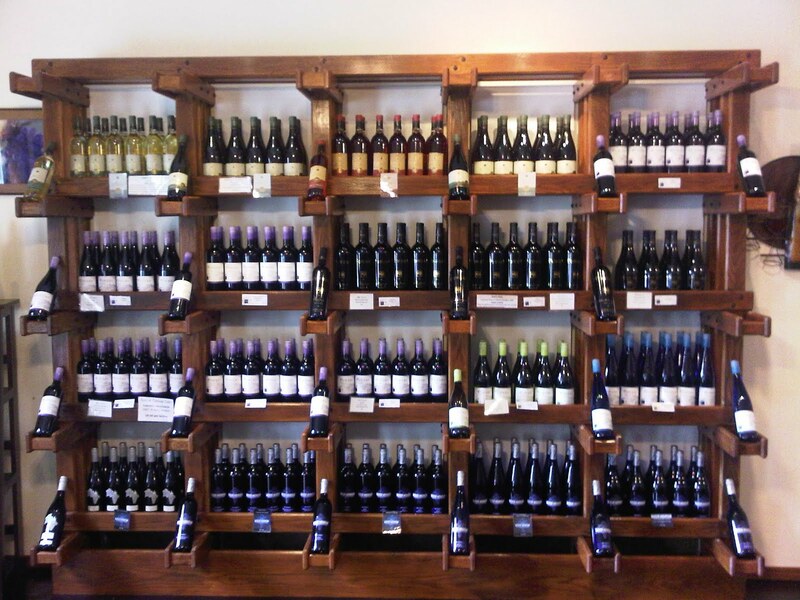 I always enjoy visiting Badger Mountain/Powers when I'm in the area, because they have such a tremendous array of wines to choose from. 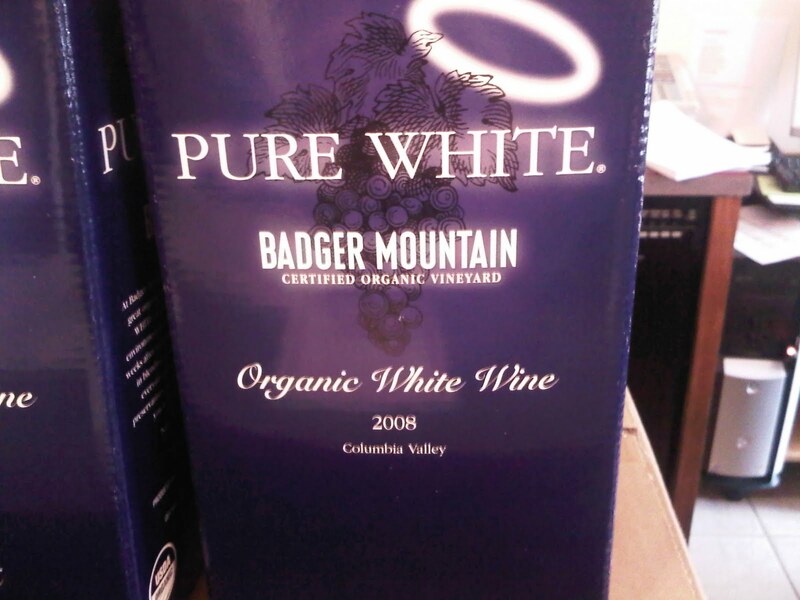 I have always been a huge fan of their Pure White boxed wine. This one is basically a permanent staple in my refrigerator. It makes it so easy to just grab a quick glass without having to open an entire bottle. In addition to the Pure White, they have several other wines in boxed form, and all are fantastic! I used this trip to stock up on a few of the Pure White boxes, they were on sale for $15/box this weekend! One of the greatest things about visiting Badger Mountain/Powers is the extensive tasting list they have. 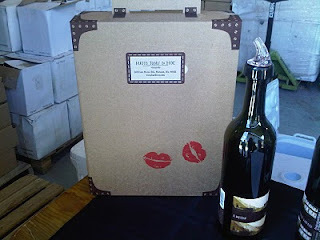 You get to taste through 10+ wines when you're there! I am a big fan of their 2008 Vintners Estate Series Rosé, which is a Cabernet Franc Rosé. There are a few WA Rosés that I consider my favorites, and this is one of them. This is another wine that I always stock up on when I visit. 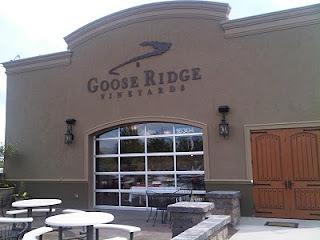 We headed back west and stopped in Prosser to do some tasting in the Vintners Village, a large site where multiple wineries have set up tasting rooms in close proximity. It makes it very easy to taste at a few during a visit. 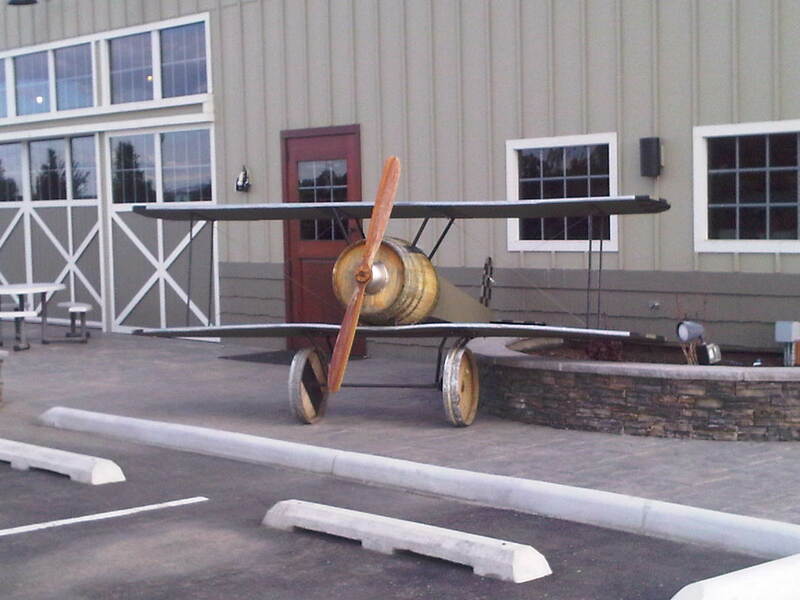 This was my first visit to Prosser to taste, and I was eager to try some new places! We started at Gamache Vintners (@GamacheVintners, @GamacheVineyard) a winery that I have been a wine club member of for awhile now. I hadn't had a chance to visit their new tasting room in Vintners Village since it opened back in August 2009. 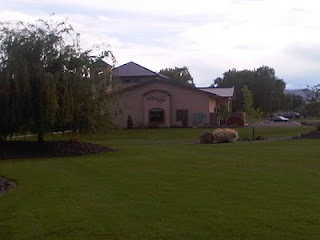 They did a great job with the winery here, and have a great big tasting room with sitting areas and a lot of merchandise and gift items for sale. It was a big step up from the small little tasting room they occupied previously! It's always great to see Cellar Manager Mitch Venohr in the tasting room when we visit, and he was a wonderful host at our visit this time. 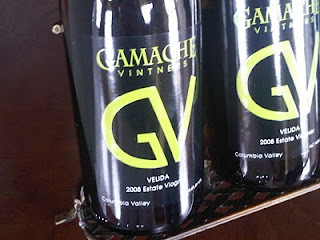 We tasted through their wines, with my favorites being the 2006 Estate Merlot, the 2005 Gamache-Champoux Reserve Cabernet Sauvignon, and the 2008 Velida Estate Viognier. The Merlot was surprising to me, as I don't usually consider Merlot to be a big favorite. I enjoyed this one a lot, and was happy to hear it was included in our previous wine shipment a few months prior. 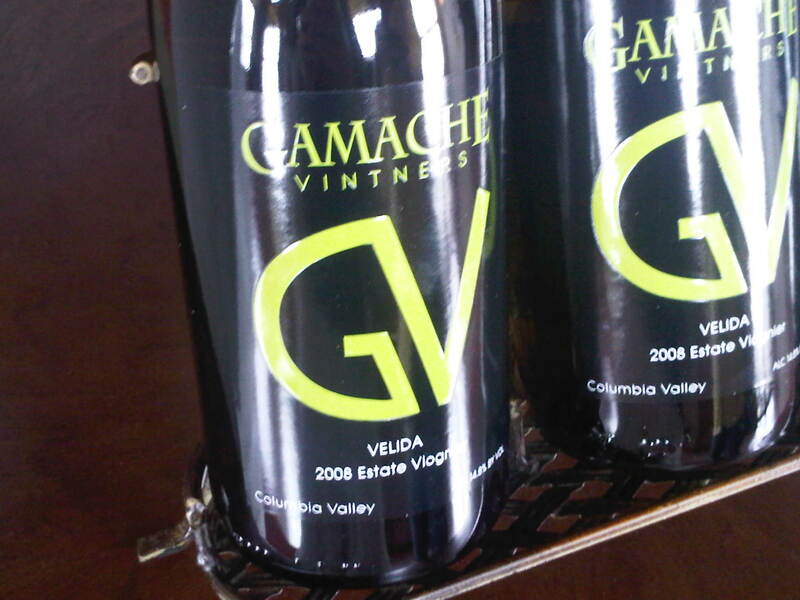 The Reserve Cab is a collaboration between the Gamache brothers and their cousin Paul Champoux. This was a great full bodied wine and I can see it aging very well (also very tasty now!). 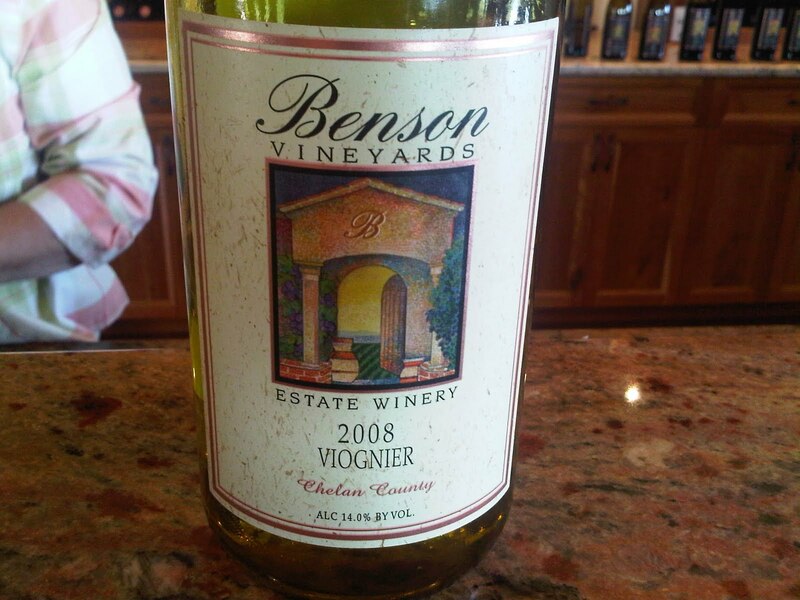 The Viognier happened to be on sale that weekend so I grabbed a few bottles of that for an upcoming party. It's a great everyday wine and I was thrilled to see it on sale at such a discount! After tasting, Mitch gave us a tour of the winery! They have a great space for their barrel room and production area. We were lucky enough to get a barrel sample of their upcoming blend. Mitch went around to several barrels and grabbed a little bit, to show us how the blend would likely end up once it was bottled. What a treat! 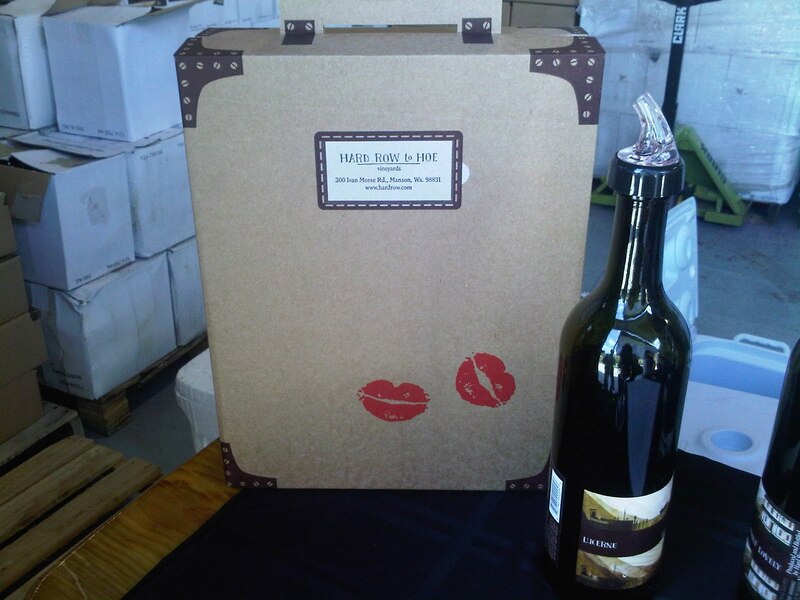 I am very excited to try the wine when it finally hits the bottle and is available for sale. 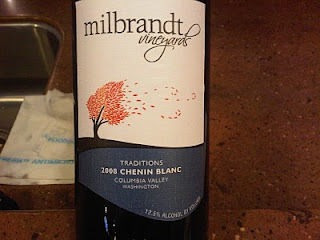 We scooted across the parking lot to Milbrandt Vineyards (@milbrandtvino) next, a winery I have been able to try at recent wine tasting events in Seattle, but had never visited. 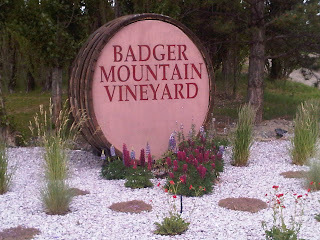 I was very excited for our visit here, as I love their Traditions 2008 Rosé, which is as Rosé of Syrah. This is definitely another WA Rosé favorite. It's a light and fruity wine that would be great with food or just to kick back with in the sun on a hot day. 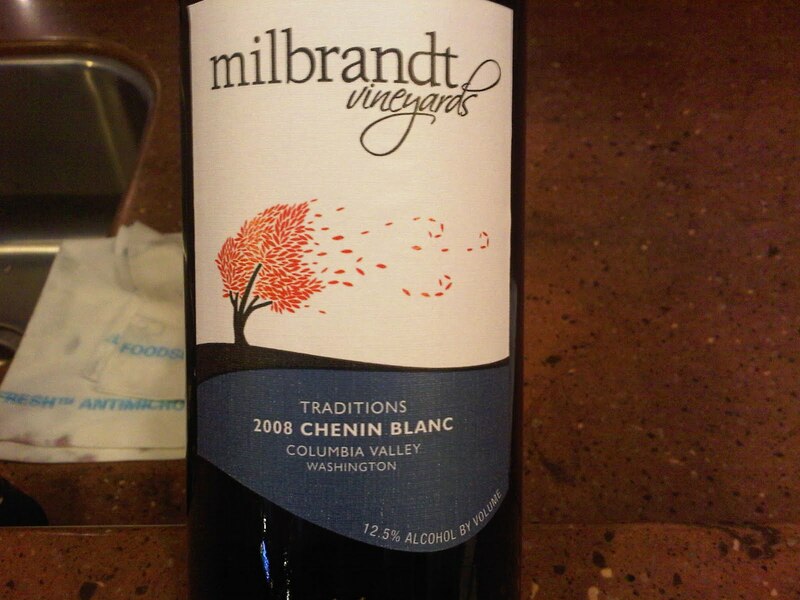 Another great wine I discovered while we were at Milbrandt was the Traditions 2008 Chenin Blanc. What a pleasant and fruit filled wine! I grabbed up a bottle of this one quick, and I look forward to enjoying it soon! 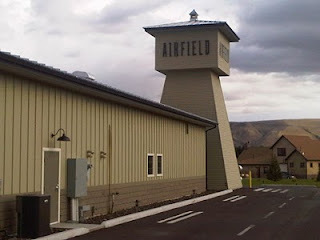 We finished up our Prosser visit at Airfield Estates (@Airfield), who has the location in Vintners Village in Prosser, and also a tasting room in Woodinville as well. 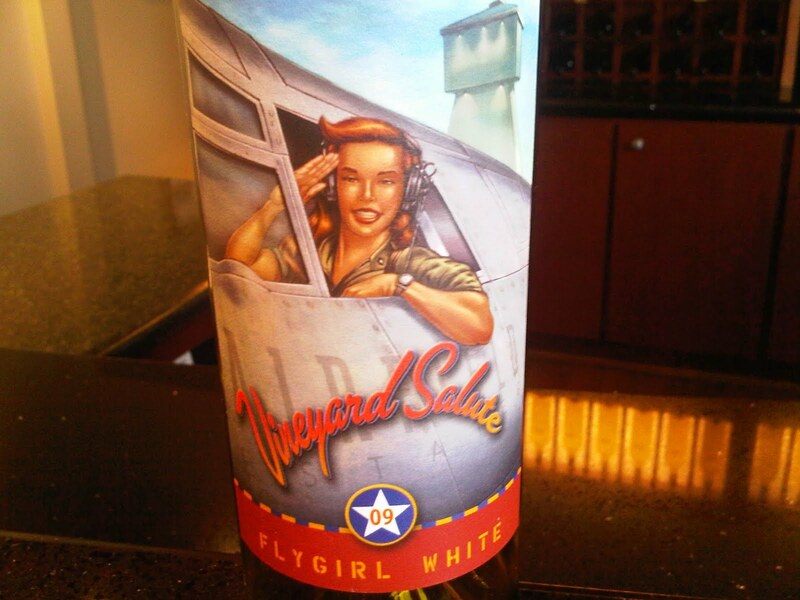 Several of Airfield's white wines were on sale during the weekend of our visit, including the 2008 Pinot Gris, the 2007 Riesling and the 2008 Gewürztraminer. A favorite of mine here included the 2009 Fly Girl White, which is a Viognier, Gewürztraminer, Roussanne, and Chardonnay blend. What would seem to be a very sweet combination turned out to be a delicate citrus wine that would pair well with a crisp salad or great sandwich. 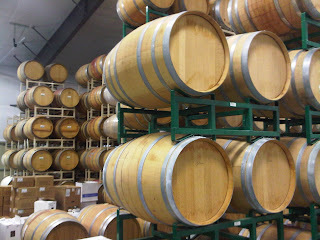 Another favorite here was the 2009 Unoaked Chardonnay, which was 100% stainless steel fermented. I have learned through my tasting experiences that it is the unoaked Chardonnay that I like the best. I really don't care much for that heavy oak flavor in a Chardonnay. This wine was dry and crisp and very enjoyable. 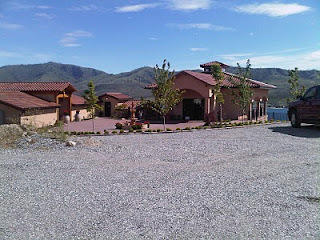 It was great to try new wines at a winery I had never visited before. I look forward to checking out their Woodinville location very soon! It was another great wine weekend where I bought too much wine (wait, can you ever have too much wine?) and enjoyed great company with friends. I love Washingon's wine regions and the Tri-Cities/Prosser area is no exception!